As most of us baby loss parents know, today is Pregnancy and Infant Loss Awareness Day. A day to remember and reflect on all babies gone too soon. Please light a candle tonight in honour of your own Angel or in memory of other Angels who have touched your life and heart. Nicholas' candle will be lit with love for him and all of his special friends in Heaven. Love to all you Angel Mommies out there. We love you, Nicholas. 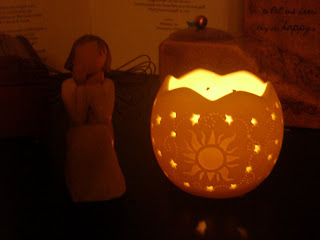 Burn your candle brightly tonight... Mommy will be looking to the sky to see it. Bree - I got the candle as a gift.... isn't it gorgeous? I will be lighting my candle tonight and remembering my sweet babies along with everyone else's precious ones. I am also releasing balloons. Thinking of you and Nicholas today. I will be thinking of him tonight as I light my candles. Nicholas is loved and remembered. just lit my candle for Cameron! thinking of you and of all of our babylost mama friends tonight! Hugs!! what a beautiful image, to look to the sky for his light. remembering with you tonite.